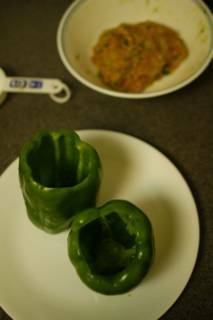 The other day I tried my hand at creating a new recipe for stuffed peppers. Looking around the kitchen, I found a ripe haas avocado and some fresh ground pork. 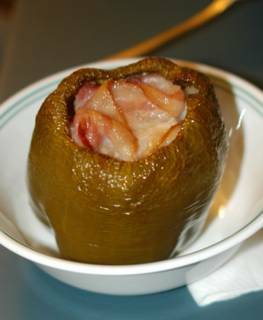 I wondered what it would taste like if I used the avocado in a meatloaf type stuffing for some bell peppers I purchased at the local market. I cut open the avocado, removed the pit, and spooned out the flesh into a bowl. 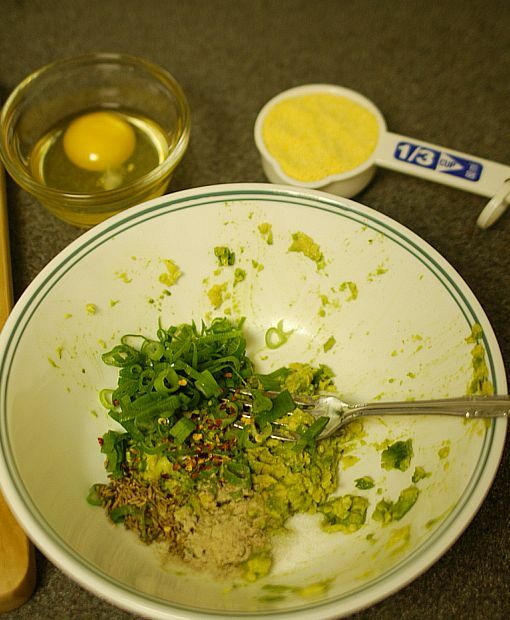 I then added about two tablespoons of chopped scallions (sometimes called green onions), one teaspoon of white pepper, one teaspoon of cumin, 1/4 teaspoon of crushed red pepper, and 1/4 teaspoon of salt. I also prepared one large egg and 1/3 cup of corn meal (to act as a binder). I hisked the egg to break it apart and added it to the bowl. I mixed 1/2 pound of ground pork with the other ingredients in the bowl by hand, then added the corn meal and worked it until it started to hold together as a large clump. Using a sharp paring knife, I cut the top of bell peppers off. I completed the coring with a spoon, scraping the ribs from the inside of the pepper. I then rinsed the peppers to remove extra seeds. I added 1 teaspoon of olive oil to each of the peppers and then spooned the meat mixture into the peppers. The mixture didn't fill the peppers all the way, so I stuffed some bacon into the pepper to top it off. 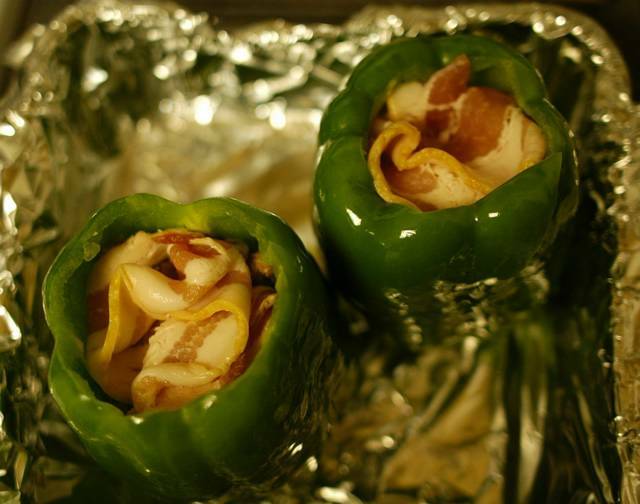 I placed the peppers into an aluminum foil lined pan for easy clean up and slipped it into an oven preheated to 350°F. After one hour, the peppers were roasted and the stuffing was fully cooked. Unfortunately, the bacon hadn't crisped. It looked good, but it wasn't seasoned enough. I ended up eating this dish with extra salt. The bacon was underdone and probably could have used a little bit of a precook in the pan. I almost forgot that an avocado went into making the stuffing because I could barely taste it. Also, the grittiness of the cornmeal took a little getting used to. Next time I'll use bread crumbs. Otherwise, it was quite satisfying and made for a decent dinner. If I was to do it again, I would precook the bacon, add more salt, and use another avocado. I'll post both recipes below. 2 large bell peppers core oil stuff bake 350°F 60 min. Avocado just seems to melt when baked. I have yet to find a good baking method for avocado. Perhaps leave out the bacon top, and spoon in some fresh avocado 15 minutes before taking it out of the oven. I'd fry up some bacon pieces until crunchy, mix with chopped avocado and spoon on top of the pork/avocado mixture. Baking avocado for 1 hour just obliterates it. Its far too delicate, IMHO. Anybody have success baking well with it? Avocado melts for me as well. But so do tomatoes (i.e. if I stuff mushrooms with them, they water down the whole oven). Surely it would be more exciting to put the avocado bits and bobs cold/raw on the top of the stuffed pepper when you've taken it out of the oven :) But maybe that's just plain mad. You said you'd "add more salt", but both recipes state 1/4 tsp. salt. Typo? I completely agree with using the avocado more like a guacamole on top. And I would also use red bell peppers, because the green ones look a bit daft when roasted. In my experience anything that requires "cooking" an avocado winds up badly. If you have to have avocado slice it and add it at the end or use guacamole. Ditto all the cooking avocado comments. Hey, fresh avocado is just great, no? Next time, try this if you don't mind just a little bit of heat: instead of the green bell peppers, get your hands on some poblanos. They're a cross (literally) between jalepe�os and bell peppers. Another suggestion is to try pre-roasting the pepper. The Mexicans would say "asar" them. Cook 'em on a grill or over your gas burner until the skin starts bubbling all around -- don't worry about the black stuff. When they look well roasted, stuff 'em in a plastic bag for 10 minutes or so. Peel off the skin. Then use 'em as you did. This really develops the flavor of the poblanos. The only problem with cooking and peeling the peppers seperately is that structurally they wont be as strong. So when you stuff them you may end up splitting them. But it might work out alright if you're careful. I am a sucker for recipes; reading them, trying them and discussing them. I really enjoyed the whole thing about your recipe--especially the very logical format. I have a son who is an engineer and a daughter who is studying to be one, so the I find the way an engineer thinks to be quite interesting. I must admit, I've never seen a recipe presented almost in spreadsheet format. I showed it to my daughter, and she agreed. I like avocado with a passion, so I'll have to try it cooked to see what I think. Carry on, Chef! i just stumbled upon this from the blogger mainpage, and i think it's BRILLIANT. rock on. Just wanted to say that I recently found your site through slashdot and I really like the way you organize the cooking information. Keep up the good work. In bringing together the stuffed peppers and zucchini (sp?) & mushrooms in the posting below, I too had the same dilemma with stuffing some peppers that I had sitting around from the farmers market. I took two zucchini's and diced them with half a pound of mushrooms and a few cloves of garlis, and sauteed in a bit of olive oil. Then cooked up a cup of quinoa by the label directions, I tossed this all together with a half a pound of browned ground turkey and stuffed them peppers full. I then sprinkled the tops of the peppers with some grated parmesan and baked until the peppers looked cooked. My husband loved it, snd now I get craving for the mixture all the time, even though under normal circumstances I don't like bell peppers. I would leave the avacado out, and serve fresh sliced avacado wedges on the side of the pepper with dried cherries. I've used avocado in a tandoori strifry before. Aand because I didn't put it in till it was nearly all cooked, it didn't melt. I would use Cracker mill... and would problal mix the avacodo,some Diced Tomato and Crisp bacon as a topper when it comes out of the oven. Seasoning the pork well with salt and pepper before cookiing..
One comment for you all on cooking avacados- If you cook them, cook them green. A green avacado has a lot more sturdiness than a ripe one, and when cooked, the hard texture vanishes and you're left with hot avacado goodness. I haven't tried baking them green, but I just sauteed a half a green avacado, and it turned out wonderfully. Chopped it into medium size pieces, fried it with a little Extra V Olive Oil, then a light sprinkle of sea salt and a tiny drizzle of Sorghum. Sounds crazy, but WOW was it good. I'm thinking the same thing could apply to a baked dish- Get the greenest avacado you can find, and see if the dish turns out any more 'avacado-ey'. Good luck! This is a super site. I'm not an engineer, however I love to cook. if you check out how the experts on avocado, the Mexicans, use it, you will find out that it is used almost always raw. Sometimes they add slices of avocado to a hot soup, or on top of hot food, but I don't remember a Mexican dish where the avocado is actually cooked. Someone mentioned boiling the bacon for a couple minutes for a situation like this. Also, if the bacon is on the top maybe a final broiler application would be good after the baking. That's too spooky -- I got thinking just the other night if there are anyrecipes using cooked avocadoes. If you cube the avocado and then grill it first it will hold its shape better when added to the mixture. Don't mush it and you'll have nice chunks of avocado in your stuffed pepper.